The upside of cleaning closets is to find sweet little notes like this treasure. 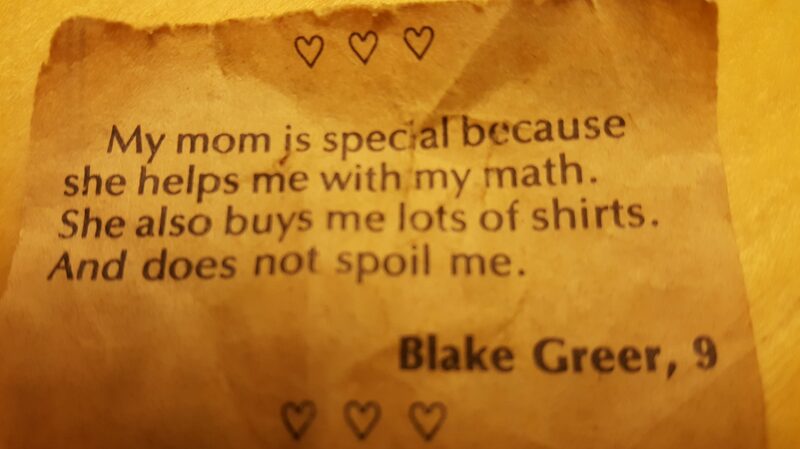 Our local newspaper compiled thoughts from third-graders about their moms for a special Mother’s Day edition. This was my son’s response. “My mom is special because she helps me with my math. She also buys me lots of shirts. Today is Blake’s birthday. Happy Birthday to my first born! I wish I could still help you with your math but your skills have surpassed mine. I can still buy you shirts. Not spoiling you was and is a joy. Now Blake has a son Aiden who will be six on January 20. Another little boy to cherish, help with his math, buy shirts and definitely not spoil! Posted on January 18, 2017 November 21, 2016 by lorigreerPosted in My JourneyTagged Family, Grandson, Mother's Day, Raising sons. Next Next post: We Can Do This! I never thought about my son and grandson as a circle of love. Thats a wonderful image. Thank you for your kind words. I like thinking that our love lives on and on through our children and their offspring. Family matters and so do friends, of course. Happy Monday to you from Portland! Yes, I feel so excited and privileged to share in their lives. I hope your Monday is going well. I can’t believe it is almost the end of January! Time does fly. Yes, family and friends are what matter most in our lives. Have a wonderful Wednesday!! That’s precious! I still have handwritten notes from various special people from over the years. These will become more significant when the world realizes how much is being lost due to texting! Good morning! I keep a lot of little notes and cards from my family & friends. They are nice reminders of love & caring. The older ones are even more precious as some of the people are gone. I agree, a text just isn’t the same. I hope all is well in your world. Happy Wednesday! You move in the best circles, obviously! Yes, I have found that the love and company of family and close friends make my world. I hope your day is going well! Happy Wednesday! What a great note to find. My son in 3rd grade wrote his favorite thing about me was when I do the dishes. When I asked him why it was because he liked the clanking noise and being able to see me from the living room. It’s amazing what children think! That is so cool…seeing how their minds work and what pleases them. I imagine that is a comfortable feeling to be able to see you from the living room. Happy Monday! Yes, finding old notes like lost treasure from the past. I found one cleaning house yesterday as well. I guess that is my reward for taking on the deep cleaning. I love finding little rewards when I clean. Once I found an old candy bar. On the spur of the moment, I decided to eat it! I knew it would be fine because of all of the preservatives. It was a bit stale but otherwise tasted fine. Looking back, I can’t believe I did that! Being human is a wondrous adventure, isn’t it? Yes! My friend recently scolded me for “being too hard on myself”. I often think I have to be perfect. Eating an old candy bar keeps me in line!! What a sweet moment that must have been when you found the note. Yes, I had to stop, read it and take a few minutes to think about my sweet firstborn. What a special, lovely thing to find! Beautiful post Lori. Thank you for this wonder reminder of the Circle of Life. It really does express it so profoundly. Happy days to end this week! What a fantastic find – just absolutely sweet. So precious and Happy belated Birthday to your son, Lori. ❤ Most lovely. Much love and joy to all. You’re welcome. I hope your week will be a good one, too. They are predicting snow for later in the week so I have to stockpile some food, reading material, etc. Yay! says the kid in me. How very sweet. That must have pot such a smile on your face.